Sometimes, listening to an entire MP3 song seems to be too much. Maybe you only want the highlight from the audio track and make it as a ringtone; or you want to trim away the parts you don’t need and retain the most important parts for some special purposes. In such occasions, what you need is an easy-to-use and reliable MP3 cutter tool. Since there are so many similar free audio cutters including those online music cutters in the market, finding out a suitable one may be a difficult task. Here we introduce 6 best free MP3 cutter software for both Windows and Mac users to cut, join and edit MP3 file in an easy way. Free MP3 Cutter is a simple MP3 program that helps you cut off the unwanted parts of an MP3 track with ease. It has no further audio editing features, but only enables you to pick the start point and end point for an audio and then remove the rest away. With Free MP3 Cutter, you can cut, crop and clip any MP3 track with just a few clicks and then save it in the format of MP3 too. If you want to shorten your MP3 audio file directly, Free MP3 Cutter is a good choice. As the names suggests, Free MP3 Cutter Joiner is not only an MP3 cutter, but also an MP3 Joiner. 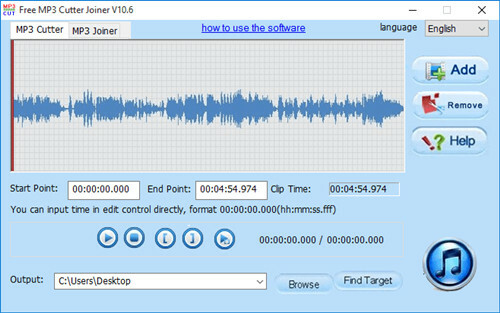 You can use this free MP3 cutter and joiner to cut or split an MP3 file with simplicity, or merge many different audio tracks together to form a new one. Free MP3 Cutter Joiner is compatible with both Windows and Mac systems. It is a relatively older program and will not be updated often. If you’re seeking for a simple editing tool to cut and join MP3 files, Free MP3 Cutter Joiner will do the job perfectly. This is another best MP3 cutter free download for PC. With Easy MP3 Cutter, you can easily split a large audio file into smaller pieces and choose the parts you want to keep with you. After trimming the MP3 track, you can convert it to other file formats such as MP3 and WAV on any mobile device as you like. Besides, the audio cutter also provides other useful editing features, such as apply fade in and fade out, adjust the sound volume, and add sound effects etc. Additionally, the program includes a built-in media player, so you can preview any changes you made to the original file. 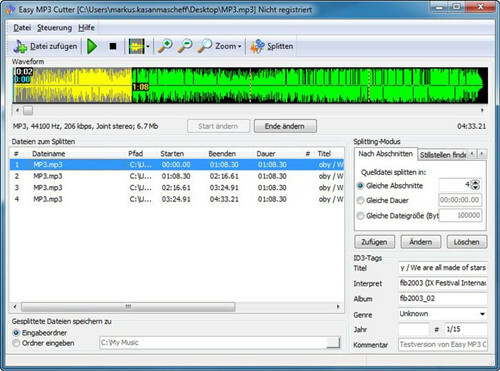 mp3DirectCut is a fast and lossless free MP3 cutter, editor and recorder. It enables you to trim, crop or cut MP3 (or even MP2) as well as AAC audio files without causing any quality damage. Since it works directly on the compressed audio file, so the original quality is well preserved without re-encoding. It also provides other additional features such as pause detection, auto cue, batch processing, cue sheet support and Unicode support. Besides, you can also record audio directly to MP3 by using mp3DirectCut. Macsome Audio Splitter Freeware, also known as Macsome Audio Splitter, is the simplest MP3 splitter freeware, specially designed for Macintosh. With this tool, you can fast cut any unprotected MP3 or AAC files into smaller portions with no quality loss. In addition, Macsome Audio Splitter supports you to import your target audio file in a batch and then split them one by one based on your different needs for each file. Moreover, the ID tags can be preserved and edited as well. 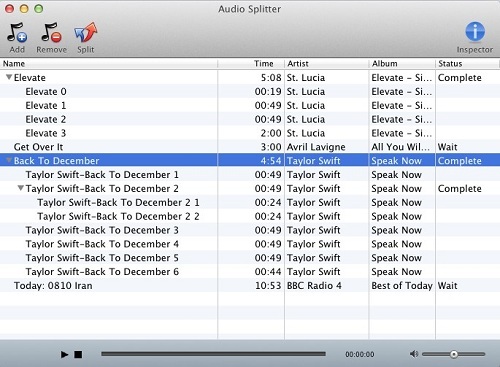 Mp3Splt is a useful free splitter to split large MP3, Ogg Vorbis and FLAC files into smaller ones, or split the whole albums to receive the original tracks without decoding. Just by setting the start time and end time, you can easily get what you expected in just few minutes while keeping the original audio quality untouched. 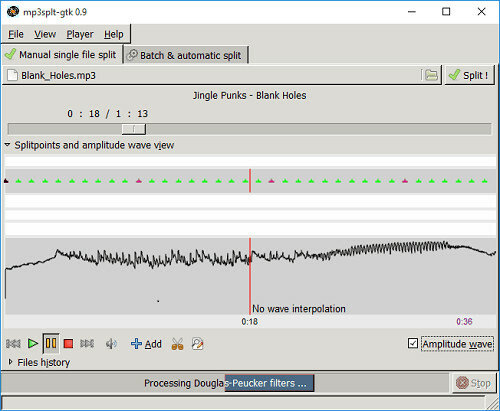 The program also supports trimming and splitting by silence detection. And both ID3v1 and ID3v2 tags are supported for MP3 files. If you only want to cut your MP3 files and have little requirements to the audio editing, you can go for these free MP3 cutters aforementioned. Otherwise, if the basic audio splitting can not meet your needs, you can turn to a paid MP3 cutter such as Joyoshare Media Cutter. 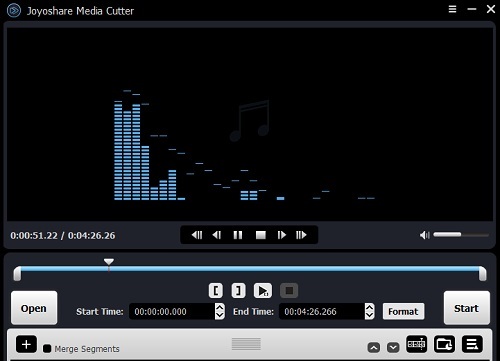 Joyoshare Media Cutter for Windows (or Joyoshare Media Cutter for Mac) is an easy-to-use but powerful audio cutter, joiner and cutter software. With this smart tool, you can not only cut large MP3 files into smaller fragments, remove the unnecessary parts of the audio, combine the audio clips together and edit your MP3 files with amazing editing features. With advanced technology, the program will cut and process the audio file at a lightning-fast speed while preserving almost 100% original audio quality. Besides MP3 formats, it also supports multiple other audio file formats such as MP3, FLAC, WAV, WMA, AAC, AIFF, M4A, M4R, AU, MKA, APE, OGG, AC3, etc. Get a free version here to have a try before purchasing it.